WHAT: Barbara Natterson-Horowitz and Kathyrn Bowers, authors of the book “Zoobiquity,” will discuss their book and hold a book signing at the University of Missouri. In “Zoobiquity,” the authors argue that while animals and humans contract the same diseases, physicians and veterinarians historically have had little communication with one another about these diseases. The authors explore how animal and human similarities can be used to diagnose, treat and heal patients of all species. Natterson-Horowitz and Bowers will discuss the latest in medical and veterinary science, as well as new findings in evolutionary and molecular biology. They also will discuss how connecting knowledge across disciplines can improve physical and mental health. The lecture is sponsored by the One Health/One Medicine emphasis of Mizzou Advantage. 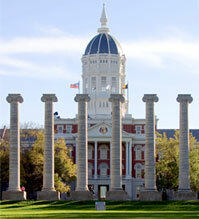 Mizzou Advantage is a program that focuses on four areas of MU strength: food for the future; media of the future; one health, one medicine; and sustainable energy. The goals of Mizzou Advantage are to strengthen existing faculty networks, create new networks and propel Mizzou’s research, instruction and other activities to the next level. NOTES: A book signing will follow the discussion, and a limited number of books will be available for purchase.